Interbreeding with Neanderthals gave some of our ancestors distinctive skin and hair, but also left behind a legacy of disease within our DNA. 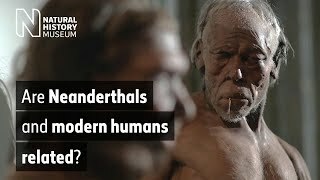 Non-African people today carry Neanderthal DNA in their genetic make-up that is associated with changes in hair and skin, but also with diseases such as diabetes, Crohn’s and even conditions such as chronic depression and addictive behaviour. Modern humans began to leave Africa around 60,000 years ago, encountering Neanderthals as they moved into Eurasia. Studies in the past few years show that modern humans interbred with Neanderthals, albeit rarely. Two new studies released this week revealed part of the legacy of these interactions, concluding that the genome, or complete genetic map, of a modern non-African person contains about two per cent Neanderthal DNA. ‘These findings provide yet another twist to the hotly-debated Neanderthal interbreeding story,’ said Museum human origins expert Prof Chris Stringer. The studies compared the genome of a Neanderthal with those of hundreds of modern humans, both from Eurasia, where our ancestors met Neanderthals, and from sub-Saharan Africa, where there would have been no interbreeding. The Neanderthal genome comes from the toe bone of a female individual, and the modern human information comes from data banks of genetic codes. The researchers found Neanderthal DNA in regions of the human genome associated with skin and hair, suggesting early humans leaving Africa benefited from interbreeding, perhaps giving them thicker, straighter hair and skin that helped them cope better with the colder Eurasian climate. However, Neanderthal DNA was also found in parts of the human genome associated with diseases such as diabetes, lupus, biliary cirrhosis and Crohn’s disease, which causes inflammation of the gut. It seems unlikely, however, that Neanderthals were living with these diseases. In their own genomes this DNA would have had a specific function. But when transferred to a modern human genome, and to people who have changed their lifestyles over thousands of years, the DNA may have triggered negative effects. One effect may be our immune systems overreacting to threats that are no longer there, such as parasitic worms. This overreaction can cause ‘auto-immune’ diseases, which include lupus and Crohn’s disease. Many of these diseases may also only show up in later life, something less likely to affect our ancestors, who died younger. There are large regions of the modern human genome that have no Neanderthal DNA in them, suggesting other genes we might have inherited have been wiped out by evolution. There is also evidence that male children of Neanderthal and modern human parents had low fertility, suggesting humans and Neanderthals were nearly biologically incompatible, something that is found today when closely related mammal species interbreed. Despite the legacy of Neanderthal interbreeding, Prof Stringer suspects that mating between the groups was the exception rather than the norm. The population numbers of both groups were low, meaning they did not come into contact with each other very often. There were also differences in appearance and behaviour, likely to have been significantly greater than between people today. See important specimens from the Museum's world-renowned collection.